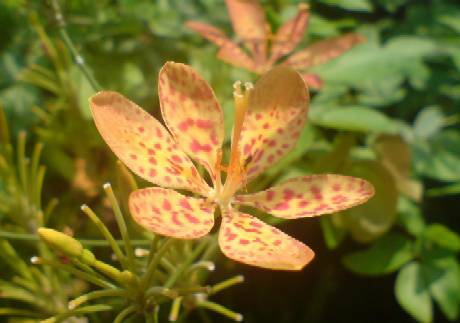 This was taken with Sony Ericsson Cyber-shot Camera Phone in the Singapore HortPark, marked as Leopard Flower and origin from China. In Wikipedia, it was stated that it is used in Chinese villages for its medicinal values. The first thing I saw in the car park of HortPark was this beautiful flower. And there were bees busy pollinating the flower. I tried to take shots of the bees on the Leopard Flower but I was too slow. According to Wikipedia, Belamcanda chinensis (Blackberry lily, Leopard flower, Leopard lily) is an ornamental plant in the Iridaceae family. In 2005, based on molecular DNA sequence evidence, Belamcanda chinensis, the sole species in the genus Belamcanda, was transferred to the genus Iris and renamed Iris domestica. The plant grows 60-90 cm tall in full sun and is often found blanketing hill sides, the flowers can range form red to yellow to orange or mixed and bloom in summer to early autumn (fall). The Louis L’Amour Collection: Start Your Own Journey to the Old West with America’s Favorite Storyteller! Get Your Risk-Free Preview! What a beautiful and unique flower!! Ooh! I’ve never seen anything like that! [email protected] last blog post..Wordless Wednesday – Who Says Boys Can’t Play With Dolls? Wow! Thats a really pretty flower! Jennifers last blog post..Give It Away Wednesday! 6.17.09 Enter Your Giveaways HERE! Beautiful, I’ve never seen anything like it! Happy WW! That is a beautiful flower. I have never seen or heard of it before. That would have been so fun to see a bee in there! Here is my Wordless Wednesday! Lovely — I don’t think I’ve seen that flower before. Oh..This is the first time i saw a leopard flower. I wonder what’s the smell of that flower because i love flowers. Thanks for the visit. Happy WW. Beautiful flower. I never saw one like that before. It’s amazing how many kinds of flowers there are. Happy WW! The other name of this flower is Blackberry Lily. I’ve never seen one of those, but it’s gorgeous. Reizas last blog post..I’m living in a zoo. That’s so pretty, I’ve never seen a Leopard Flower, cool! At first glance, I’d thought it was some special kind of orchid. 🙂 Beautiful. Wow! What a beautiful flower! Very beautiful! I love your camera if it takes that great of pictures! Felicias last blog post..Wordless Wednesday: First Hike! @ Mozi and oysterblogger, thank you for dropping by. It is a lovely flower. Janices last blog post..Skywatch Friday: Oh I do like to be beside the seaside! Wow, that’s beautiful!! Thanks for stopping by yesterday! AJacobsens last blog post..My baby is 5 today! Marlenes last blog post..Where’s My Rice? What a beautiful flower and the name is very appropriate! Thank you so much for explaining a bit more about it. Wonderful photo- the clarity and definition of the flower are amazing! what a lovely flower. i would love to have such flowers in my garden. That is a fantastic flower. Thanks for sharing. I’ve not seen one like this before. It is beautiful. I never notice such beautiful flowers are original come from China! I should learn the way you study,BK! Thanks! wow! that’s a pretty flower! @ Sterndal, it is pretty indeed. If you are in the Philippines, this flower may be suitable to be grown in the Philippines too. However, I am not sure where you may be able to buy it in the Philippines. What a gorgeous flower. Here in San Francisco there are many flower gardens with flowers from China and the Philippines, but I don’t think I’ve seen this one before. I love lilies for the beautiful fragrance they give off and these look like they would be very special indeed. @ Tina, when I was looking for information about this Leopard Flower, I saw it in Wikipedia and there is a picture showing Leopard Flower growing in Pittsburgh, Pennsylvania. So I think it should be available in US too. I am not sure about San Francisco though. Wow! What a beautiful flower. I love it! .-= Cascia @ Healthy Moms´s last blog ..Potty Time Tuesday A Continuing Journey =-.